My good friend Karin insisted I try this recipe after I told her that I made Mexican rice from scratch. It's taken me three months to finally buy some frozen traditional vegetables to do it, but here it is. I must say, it is a contender for my favorite Mexican rice. It tastes just like a lot of Mexican rice I've had at restaurants, and the little veggies make it really authentic. A fantastic side for any Mexican dinner, and easy too. I've cut the recipe in half because that's what I did when I made it. I knew for sure 3 cups of uncooked rice would yield more than we could eat at our little dinner party. Everyone LOVED the rice, by the way. If you're looking for real Mexican rice to go with your meal, this is it. Do it. In a very large skillet, heat the oil over medium heat until it shimmers in the pan. The oil should be very hot. Next, add the rice and stir regularly until the rice is a pale toasty brown..
Add the onion and stir for about one minute until opaque in color. The rice should now be a deeper toasty brown. Stir very well until all of the broth and tomato sauce is incorporated throughout the rice. If you don’t stir well, the rice will be red in spots and white in others. You don't want this. Turn up the heat, and bring the entire mixture up to a boil. Add the frozen vegetables. Turn the heat down to a low simmer. Cover tightly. Simmer for 25 minutes. Turn off the heat. Let the rice sit for 20 minutes. Do not at any point take off the lid. You will be tempted to peek at the rice. Don’t do it! Fluff up the rice and season to taste. Serve with your favorite Mexican dishes. *I didn't have chicken stock on hand, and now that I'm typing this, I realize that I only used 2 cups of water, not 3. The rice turned out fine, as pictured above. Yes, I said I used water...and I also added 2 1/2 chicken bouillon cubes. Sorry, Karin. Makes, oh, I'd say 8 servings. glad you liked the rice. you used the correct amount of liquid - the tomato sauce counts. it's basically double the liquid for the amount of rice you're using. you can use bouillon or broth or stock or water. the more flavorful your liquid, the more flavorful your rice. thanks for giving me a nod in your fabulous blog-world. For a short cut I often use jarred chunky salsa (instead of the tomato sauce and some of the veggies) mixed with my broth. Turns out delish! 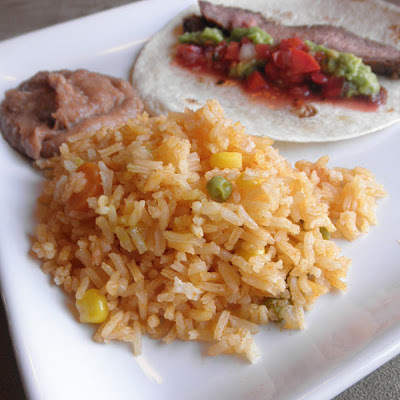 I use salsa in my other Mexican rice recipe on this blog. Don't tell Karin, but I think I prefer my other recipe. Shhh! It's a secret. Try some cumin in your rice. Your recipe is very close to mine except for the cumin give it a nice taste. Thanks. I think I'll try that. I do think this rice needs a little something more. Sh. Don't tell Karin. She'll freak out. I literally just made this and it turned out different. I followed the exact measurements however mine came out redder and smells more of tomato than I think it should. Is there anyway to fix this? Hmmm...Are you sure you did not use tomato paste instead of tomato sauce? Maybe it changes depending on the brand of tomato sauce you use. I don't think there's a way to fix the batch you just made. Next time maybe use half the sauce and make up for it with additional water. That's my only guess. :/ Sorry I don't have any other ideas for you right now.